HillTown Grazers produces meats with a commitment to healthy animals, locally sourced feed and long term land stewardship. Our animals are raised with respect in forest and pasture. 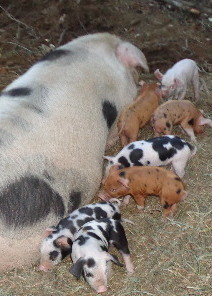 Our heritage pigs roam freely and are fed a unique locally sourced diet. Instead of commercial grain often used to supplement a pastured pig’s diet, our pigs are fed a diet of chickpeas, granola, dairy and vegetables all sourced locally. While it takes some old fashioned care and ingenuity to mix our own balanced diet, we think it’s worth it. Not only are our products uniquely delicious, our animals, eating as they did 100’s of years ago, are slowly helping us root and ruminate our 1200 acre farm site back to its former glory!